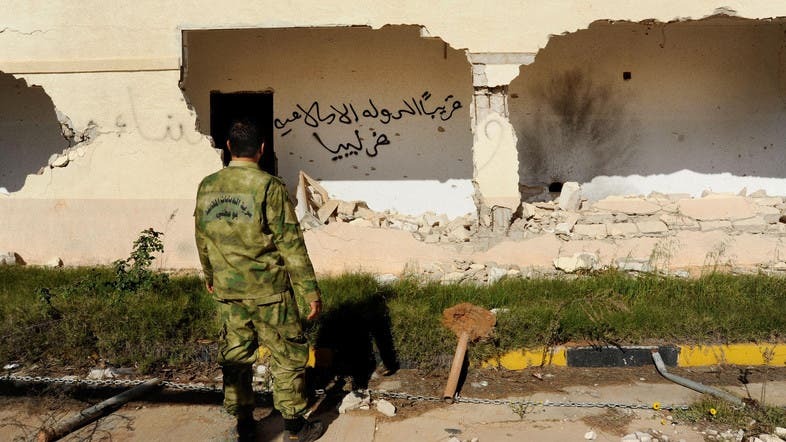 In this picture taken Wednesday, Feb. 24, 2016, A Libyan army soldier looks at damages with Arabic that reads, 'soon, the Islamic State will be in Libya,' in Benghazi. The ISIS group has around 5,000 fighters in Libya with the capacity to carry out deadly raids into neighboring countries, Italy's foreign minister told parliament on Wednesday. The figure is at the top end of recent Western estimates of the number of ISIS fighters in Libya and is likely to further fuel concern over the threat posed by the group's establishment of a base in the troubled north African state. "According to our analyses, there are today around 5,000 Daesh fighters in Libya," Foreign Minister Paolo Gentiloni told the Italian Senate, using an Arabic name for ISIS. "They are concentrated particularly in the area of (the city of) Sirte but from there they have the capacity to carry out dangerous incursions (into neighboring states)." Authorities in neighboring Tunisia have accused ISIS of being behind Monday's attack on an army barracks and police and national guard posts in the border town of Ben Guerdane. Tunisian security forces say they have killed 43 suspected militants since the attack. Italy last week dispatched a reported 50 members of its special forces to join US, British and French agents already on reconnaissance and intelligence operation services in Libya. Rome has also recently authorized the United States to launch drone strikes into its former colony from an airbase in Sicily in what has been seen as a sign of Western powers moving towards more active involvement in the country. Gentiloni told the Senate there were no plans for action beyond the possible deployment of an Italian-led peacekeeping force if and when Libya forges a unified national government with the authority to request outside security support. "The government will not be dragged into a pointless adventure that would be potentially dangerous for our national security," the minister said. "Military interventions are not the solution," Gentiloni added, recalling that "Libya is six times the size of Italy and has 200,000 armed men between the militias and the army."